They're not good. Amazing what you can learn with a DMM: the pack is very unbalanced (batts resting at very different states of charge after use & charging), and I've already found several that suffer from serious voltage "sag" relative to the others, when measured immediately after loading them up (driving). And I've also found a few batteries that appear reasonably healthy. That didn't even qualify as a "rolling stop"
I was thinking that since you have a ready supply of used batteries, you could continue to collect them, charge them, load test them, and then keep the ones that do the very best. Yes. The closer a flooded battery approaches full charge, the more it will "gas", releasing H2 and O2. Many conversions with batteries enclosed in the trunk or in battery boxes in the passenger compartment (ie hatchbacks), run brushless fans to circulate outside air through the boxes. You're welcome. I was quite amped about the whole thing myself! Also did a speed test: achieved 42 km/h / 26.1 mph on a flat road, which while it doesn't sound impressive, is 1.1 mph higher than the speed limit of NEV/LSV's. I outpaced a 12 year old on a bicycle to around 30 km/h. Barely. The road dipped slightly after reaching that speed and then leveled out again. I got up to 49 km/h (29 mph) in the descent and the car seemed to hold that speed up to where I had to brake for a turn. And by the time I reached that turn, one of the undersized cables on the pack was warm enough that I could smell it. All of which is to say, with a better pack and proper wiring, I have no doubt the car will be adequate for in-town driving. OK, so what Metro parts are leftover to sell? Not enough to pay for replacing the batteries we're sure to murder as we figure all of this out! Yeah - that was classic. Couldn't have scripted it any better if i'd tried. 5) buy a new matched set of batts. I'm leaning towards #4, since we're in no panic to have the car in regular service yet. If you're carrying say 8 batts in the vehicle, you'll get more range if you discharge them all at once than if you discharge them 4 at a time. "Peukert's effect." Definitely. Drawing a battery down below a certain cell voltage under load will permanently damage it. The only way to know for sure is to be watching. (I haven't been. Batteries have already been (further) damaged than they were when we got 'em. Today: finally some action on the welder front. Went with my brother to see a guy he knows who's a welder by trade. Neat guy - does artsy stuff on the side with his machines at home - sculptures, etc. Keep in mind my brother has done a little welding before - stick & MIG. But I've only ever tried brazing.. Anyway, we both described the kinds of things we had in mind for using a welder, and he advised us to get a middle of the road wire-feed machine. There are a couple on sale around here for about $300. 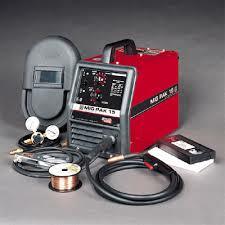 MIG capable, if we want to add that on, but he said flux-core wire will suffice. He has one of each in his shop, and he gave us a super quick demonstration, then asked if I wanted to try. So I got to weld my first bead today (wire feed). Kind of cool Said I was OK for a beginner, too. For joining 1/8 angle iron for the batt trays, he said the machine probably won't quite do a big enough bead first pass, but you can always go back over it a second time and build it up. So now we just have to actually pick one out and buy it. It's fun when projects justify tool purchases.